Michael B Jordan as Adonis in “Creed II”. A TAD over four decades ago, Rocky Balboa came to the screen. It wasn’t Sylvester Stallone’s first film role, but it was the first of eight times in which he plays the heavyweight boxer who even more than John Rambo is his signature character. Stallone, now 72, once again has written a screenplay in which Rocky appears. Rocky is no longer the heavyweight from Philadelphia who wins by combining muscle and brain. But the brain is still active, especially when it comes to tactics in the ring. The narrative harks back to the fight between Rocky and Apollo Creed who later died after fighting Russian heavyweight Ivan Drago (Dolph Lundgren). The film chronicles their meetings between Apollo’s son Adonis and Drago’s son Viktor. Between bouts, Rocky coaches Adonis, who has become world champion on a technicality for which he has paid a hefty price. Viktor has put him in hospital. When Adonis looks likely to lose the title if he doesn’t defend it, Rocky resigns as his coach and Buddy (Russell Hornsby) takes over. When Viktor soundly defeats Adonis, Rocky reverses his decision and coaches him for a second defence in Moscow. No prizes for guessing how that ends. But the screenplay throughout the film regularly turns to Rocky for advice and homespun wisdom. A sub-plot involves Adonis and his wife Bianca (Tessa Thompson). Another sub-plot involves Rocky preparing Adonis to defend the title again. In these moments, intelligence and humanity offset the fight sequences. 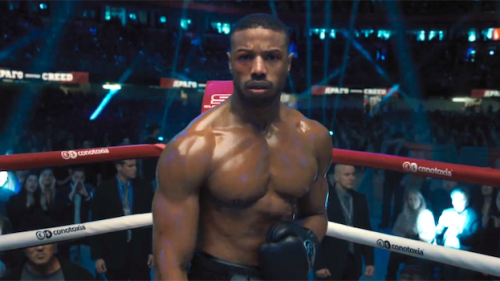 However, the film’s real stars are Michael B Jordan as Adonis and Florian “Big Nasty” Munteanu. We’ve seen Jordan in this role before. It’s Munteanu’s feature debut and he doesn’t say much. He’s taller and heavier. But Jordan’s feet and fists are faster and he has much to say. Both are splendid physical specimens. The choreography of the fight sequences is impressive.